Members of a Michigan militia, who were acquitted last year of trying to overthrow the federal government and murder police officers, are suing the FBI and Michigan State Police, saying feds violated their constitutional rights by raiding their homes and seizing their guns, the Detroit Free Press reports. The raids in March 2010 led to numerous charges but each defendant was acquitted. 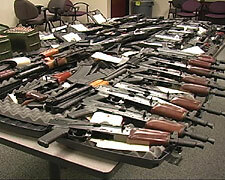 During the raid, agents seized more than 40 guns and 100,000 of ammunition. Posted: 4/9/13 at 9:04 AM under FBI, News Story.